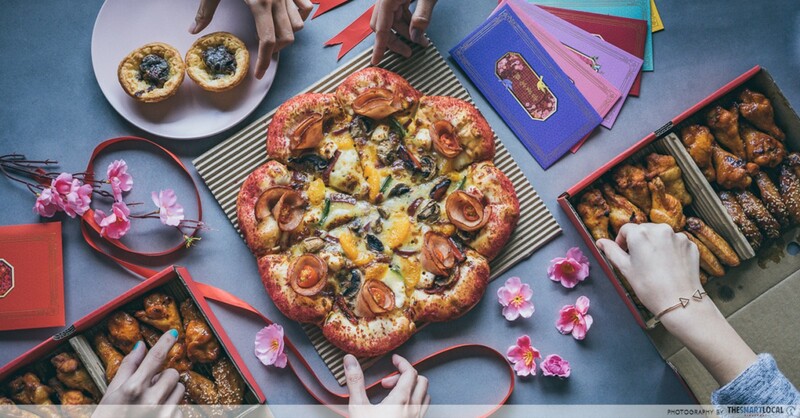 Thankfully, Pizza Hut has come up with a new, limited time, huat-themed CNY menu to bring the fortune of delicious nomz right to your door! 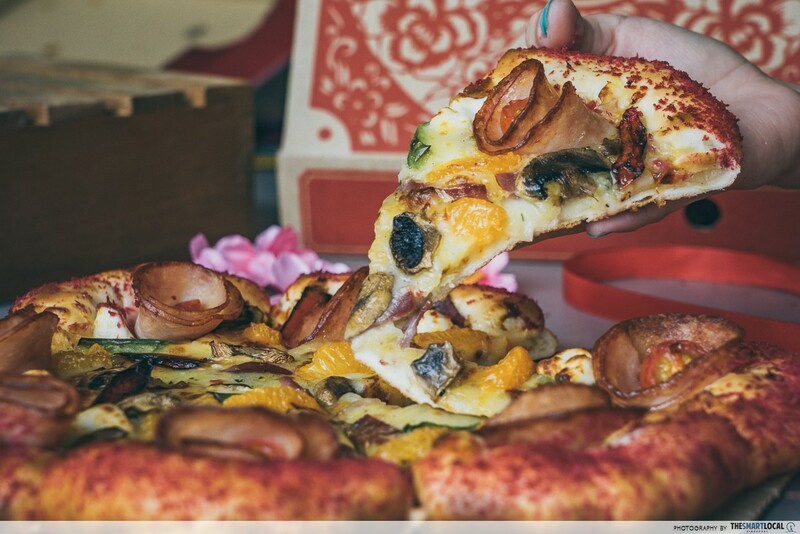 “3 isshaped like a pizza for a reason”... And ain't it true especially for this Pizza Huat Blossom (from $28.80). With an iconic crust that oozes 2 types of cheese and a pillowy base heaped with a medley of chicken ham, turkey bacon, mushrooms, capsicum, cream cheese and mandarin orange slices - everything about this pizza screams prosperity and abundance. 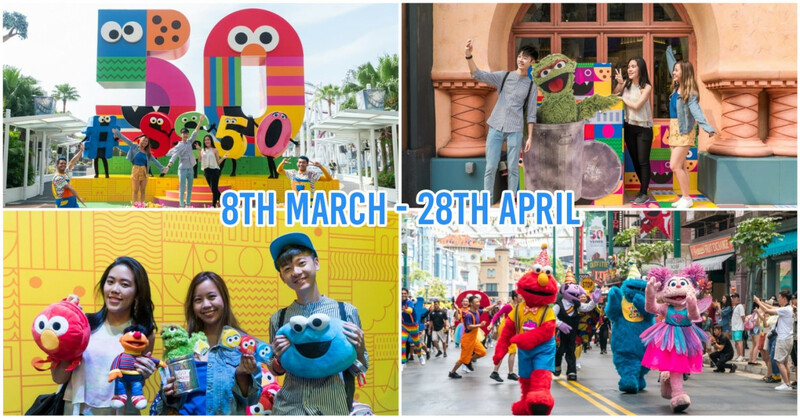 They’ve even sprinkled edible gold dust on it for extra huat! The most prominent topping in this floral shaped goodness is the sweet mandarin oranges that take the place of the usual pineapple. 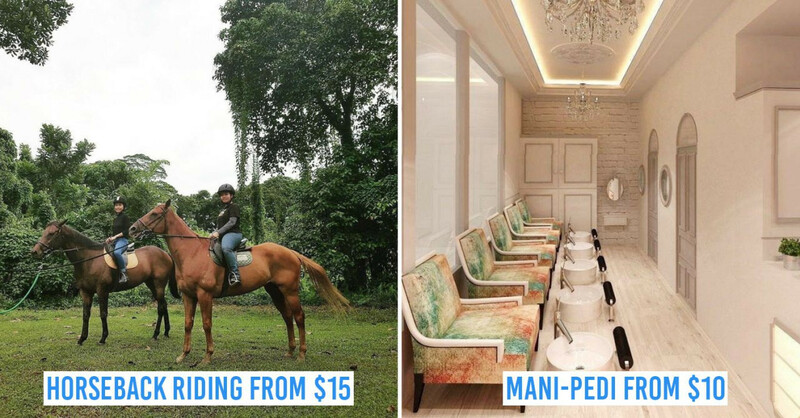 It might seem unorthodox but the sweetness adds a refreshing kick, and of course, your elders will love the extra “大桔大利” (big luck, big profit). 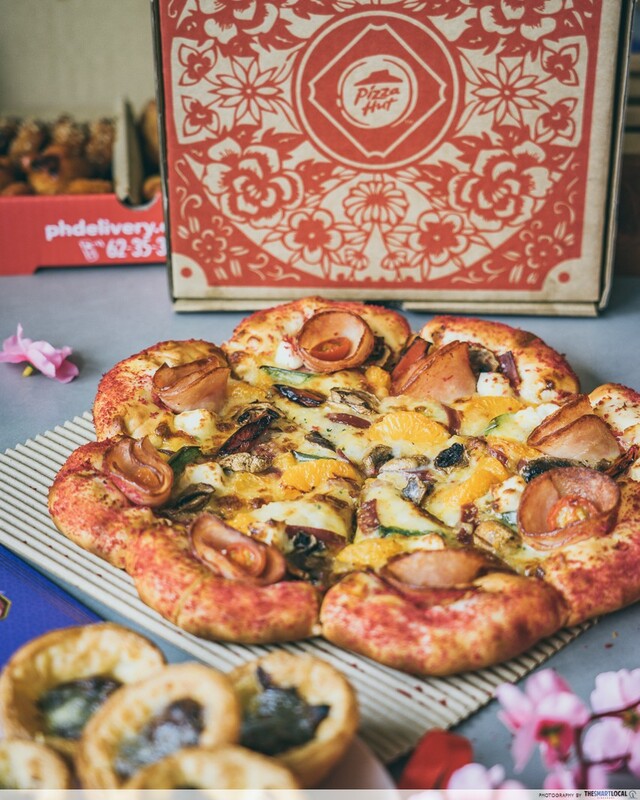 And you don’t have to worry about pleasing all your guests with just this one pizza - a top up of just $5 will let you add on any of Pizza Hut’s regular pizzas to your purchase of the Pizza Huat Blossom. 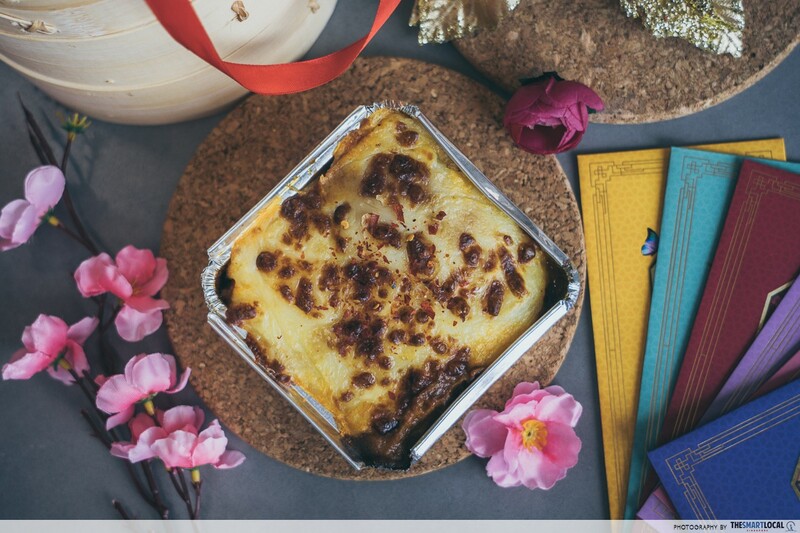 The next must-have item from their prosperity menu is the bountiful The Huat Box (add on special: $20.90). 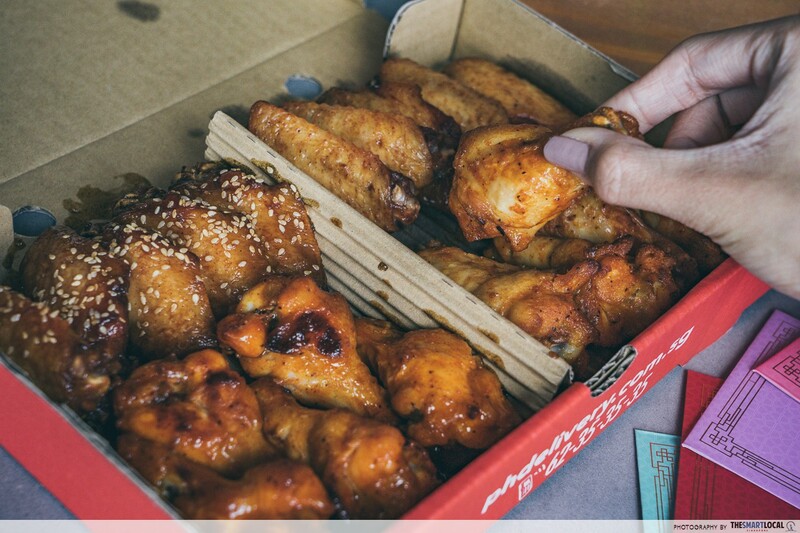 More than just the standard Sweet ‘N’ Spicy Drumlets and Honey Roasted Wings we love, Pizza Hut is now bringing us some new top runners in the flavour department: Buffalo and Honey Soy. Perfect for chilli and non-chilli lovers alike! The first two aren't too heavy in the chilli department, and just right for spicing up the night. 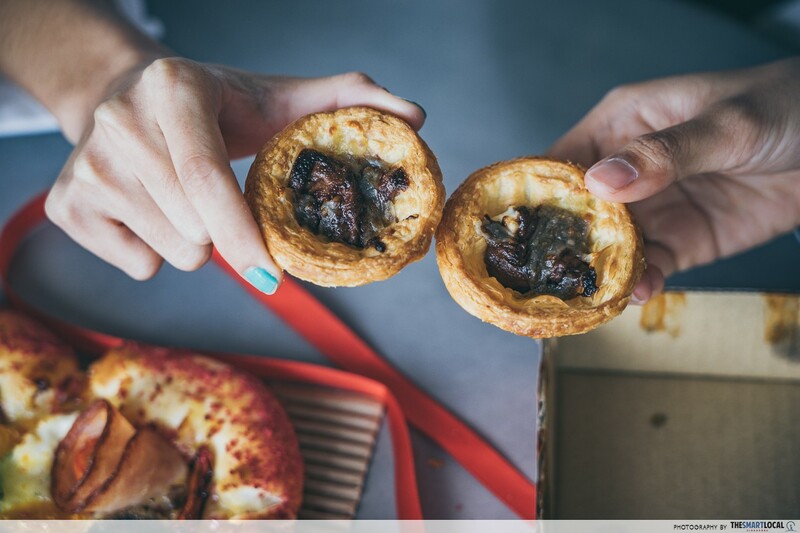 Move aside, pineapple tarts, it's time we made space in our stomachs for these epic cheesy Choco Hazelnut Tarts (4 pieces for $6). 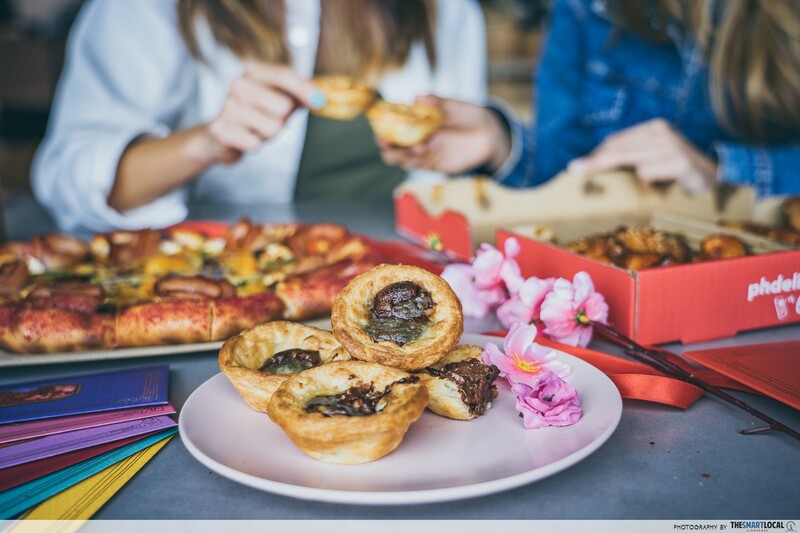 A box of this sweet and savoury pastry is needed to complete your CNY gatherings - especially if you have Chocolate & Hazelnut lovers in your group. 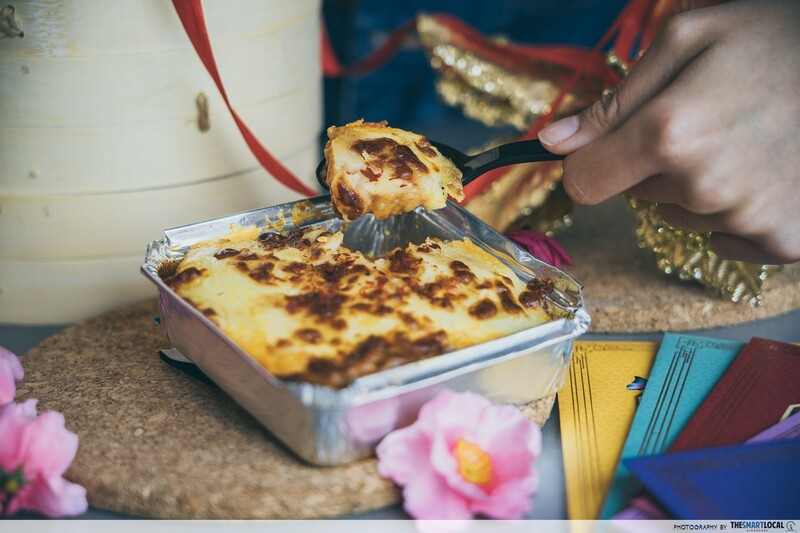 Think a blend of buttery pastry, cream cheese and chocolate, topped with melted mozzarella cheese - it’ll be hard to find someone who won’t like this! “Anything is good when it is made with chocolate” and this tart proves the saying right. “Pies mean Thanksgiving and Christmas” and now, Chinese New Year too! If you’re a sucker for fusion food, make sure to add the Curry Mash Pie ($6.90) to your online cart. Although it looks very much like a regular shepherd's pie, hidden below the layer of creamy, smooth mash is thick, fragrant curry full of succulent chicken pieces that packs some real heat. This works perfectly as a snack for 2-3 people or a meal for one. 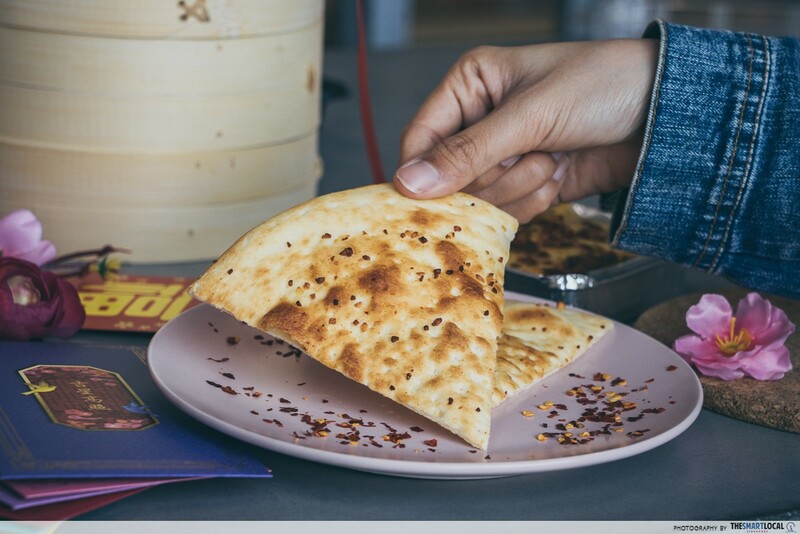 Also new on their limited edition delivery menu is the fragrant pizza-shaped Garlic Pita Bread ($6.00) - an uber addictive side that will activate your special endless-pit-of-a-stomach reserved especially for CNY. We love it for its chewy texture and light touch of butter and garlic. 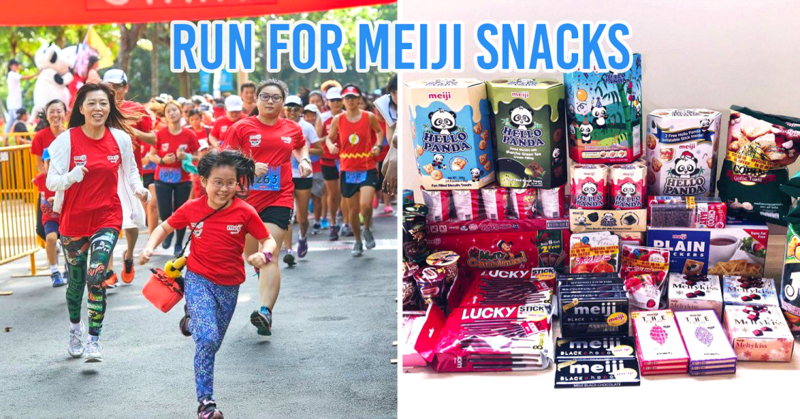 We did not feel jelak even after chewing on several slices! 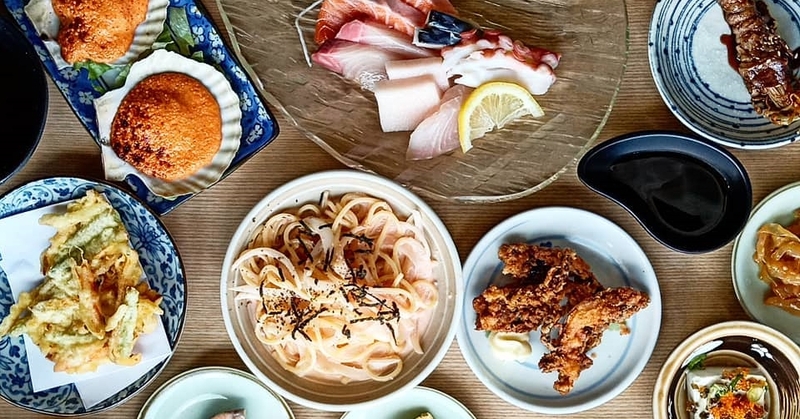 There is always this one dish that dominates the dining table with its wafting aroma, and this one is it. 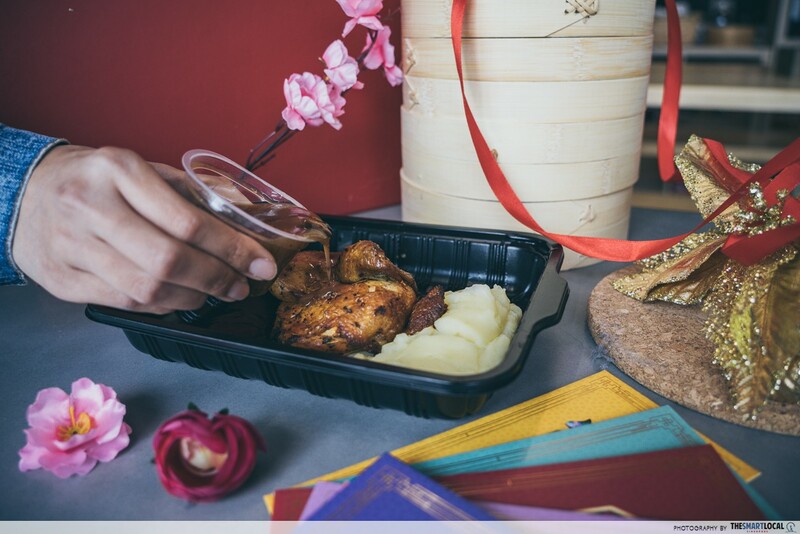 The moment you come into close proximity to the Roasted Half Spring Chicken with Mash Potato ($14.90), chi-ken not say no to its tender, juicy meat! Creamy and smooth, the mash potato compliments the herb-marinated chicken perfectly. 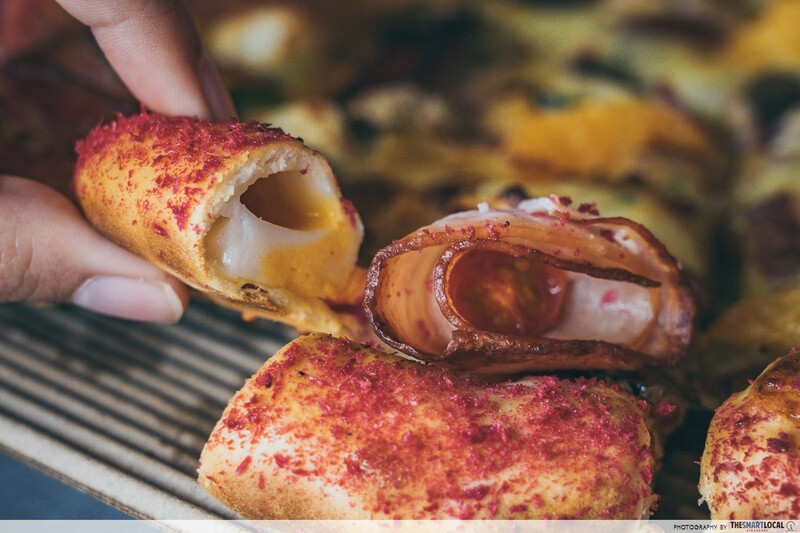 Complete the dish by drizzling the pepper onion brown sauce over it and don’t forget to ready your Insta story boomerang! 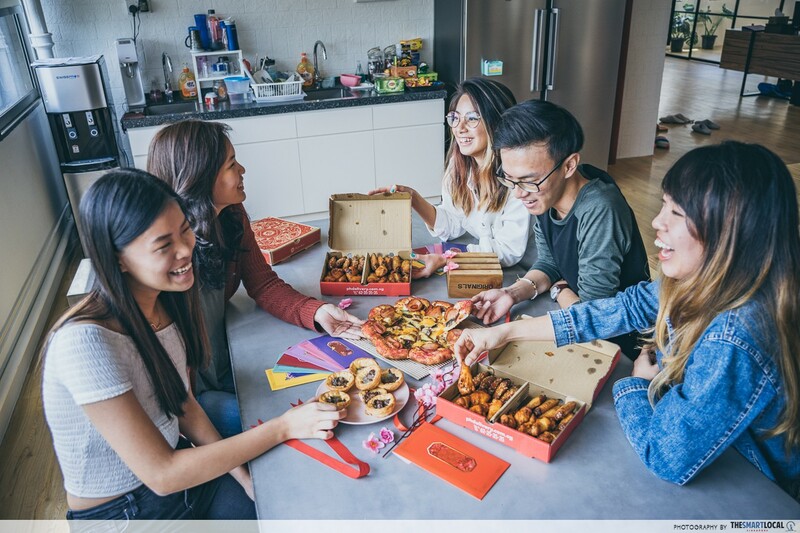 Extra guests and closed supermarkets have nothing on you now because Pizza Hut’s super huat delivery menu has got you covered this Chinese New Year with fuss-free meals delivered right to your doorstep! 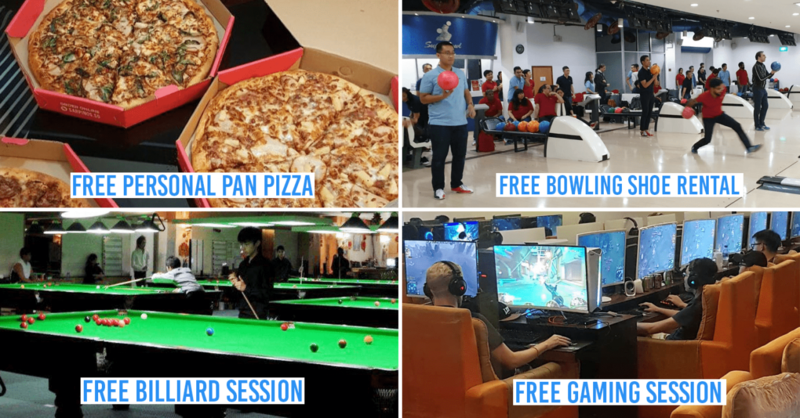 If these newest à la carte items aren’t enough for your gathering, you can consider getting their Big Golden Box ($38.00), Prosperity Family Deal ($59.90), and Abundance Party Deal ($99.90) which come with an assortment of their limited edition CNY items and cater to groups of 3-4, 6-8, and 8-10 persons respectively. 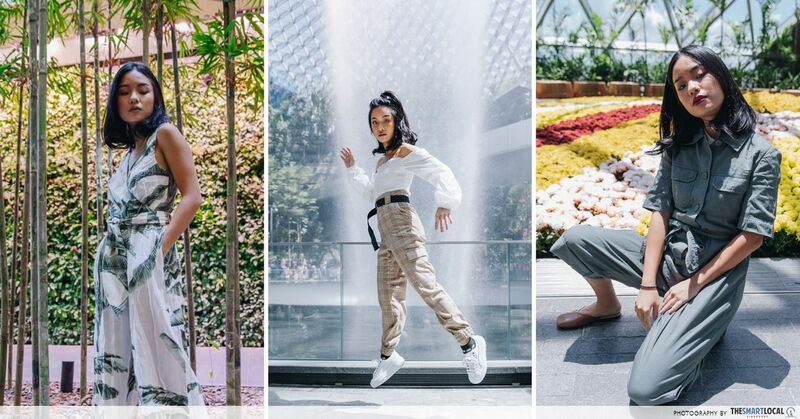 Pssst, two of the above set party deals also include a set of their limited edition ang pao packets you might have spotted in the photos above! 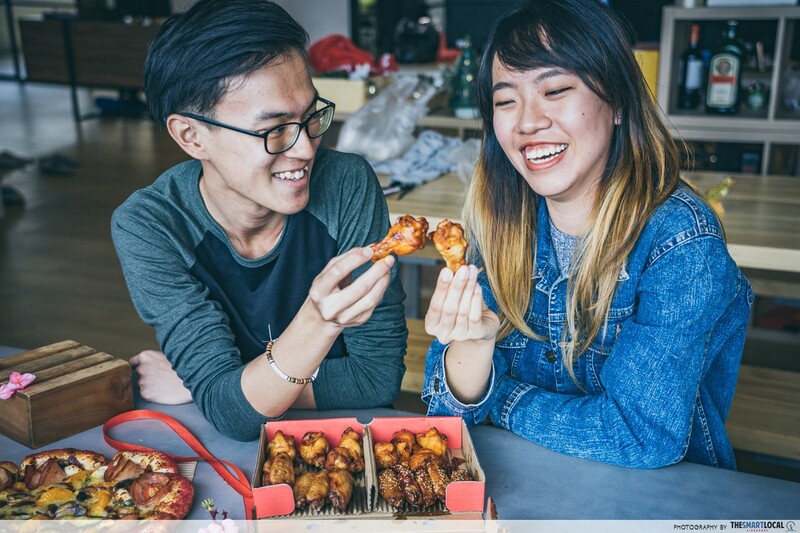 And beyond their newest huat delivery menu, Pizza Hut has also introduced a couple more festive goodies exclusively for dine-in customers such as the Cheddar Baked Salmon Meal ($17.90) and the Prosperity Platter (add-on special: $15.90) which comes with their Honey Roasted and Sweet ‘N’ Spicy drumlets, onion rings, oven-baked country pie and a cheese dip. 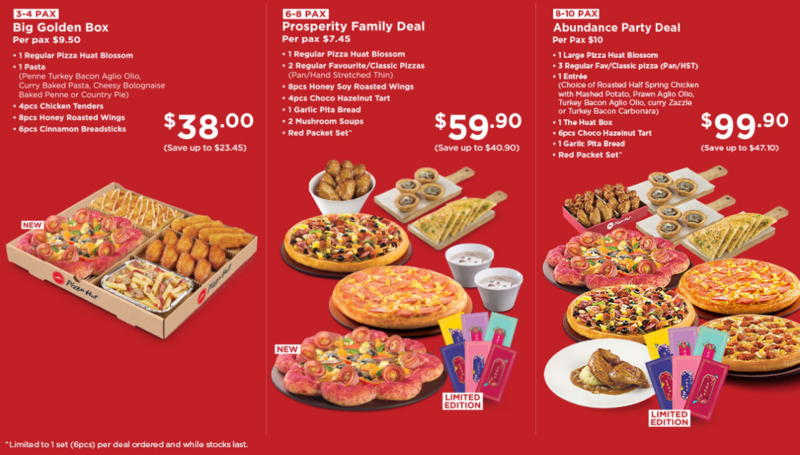 Find out more about Pizza Hut’s new Huat Menu here! 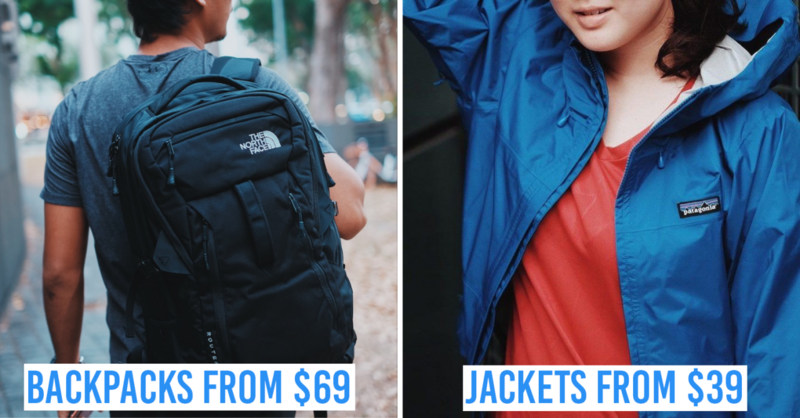 Note: This promotion is valid until 28 February 2018 or while stocks last. This post was brought to you by Pizza Hut.